I took a detour along a scenic route between the Mullet peninsula and Ballycastle in County Mayo. There was quite a bit of rain, and suddenly I came upon what I thought were road workers. A truck was backing into a work site. Some other people dressed in street clothes began to run for the open gate, and what I realized were Gardai (police officers) were grabbing them and holding them back. The Gardi formed a line to prevent the people from passing. One person was taking photographs. After ten minutes of sitting on the road, waiting to pass, they finally cleared the people and I was able to get around. I passed a caravan (camper) with the words “Stop Shell” written across it. There were far more Gardi than I realized, at least fifty of them. As I was leaving, they were spaced along the road, one every few hundred meters, each with a radio. 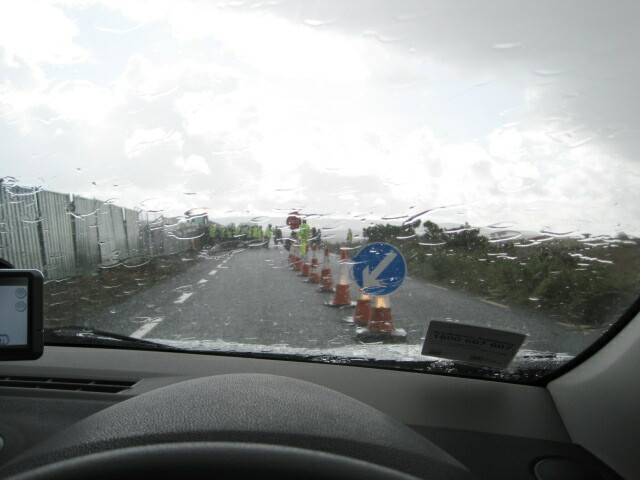 When I reached the end of the road I stopped and rolled down my window to ask the final Garda what was going on. He said that Shell was putting in some kind of pipeline to a refinery, and that students were protesting it. It had been going on for years. A few days later, I caught a new program on television about the process of fracking, which has been going on in the US for awhile. Essentially it involves extracting natural gas by using pressure from water, sand, and chemicals. The chemicals are the primary concern of protesters and activists. It has potentially serious environmental consequences, and is largely unregulated in the US.